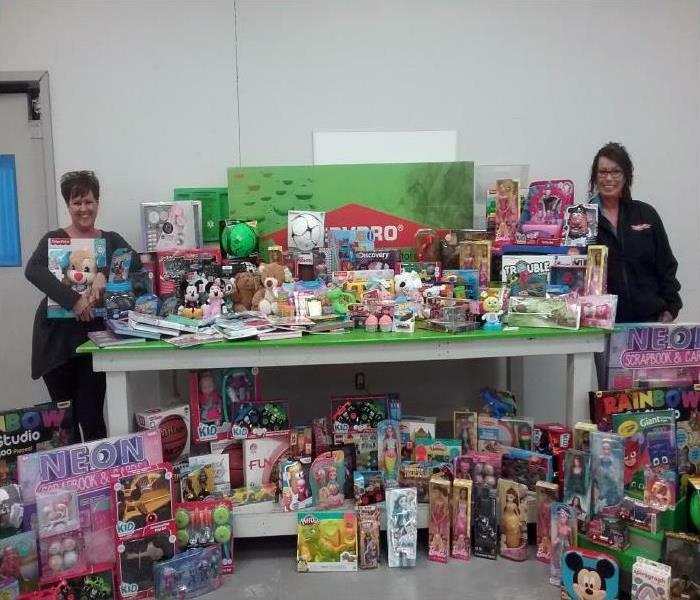 Our team at SERVPRO of Stockton had a blast hosting a holiday toy drive at Walmart. With help from our friends, family, and local businesses the results were fantastic. We take immense pride in supporting local charities! Our team had the pleasure of hosting a Lunch & Learn Event for two Property Management companies and a Senior Living Facility. The topic of our discussion was "Mold is a 4 Letter Word". We wanted to educate our attendees about the dangers of mold and how our team can help. We had a great time! 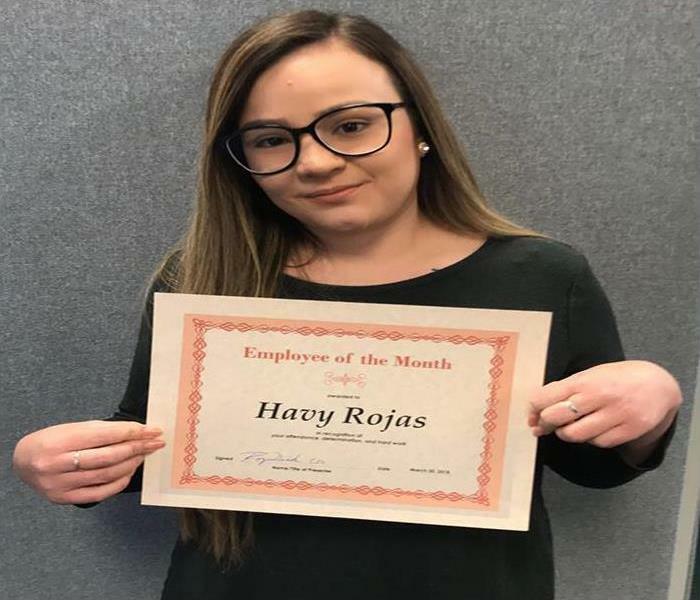 Our family at SERVPRO of Stockton would like to recognize the April Employee of the Month is Havy Rojas. Havy is considerate, intelligent, and enthusiastic. She is a valuable member of this crew, and we are so proud of all her hard work. Congratulations Havy! 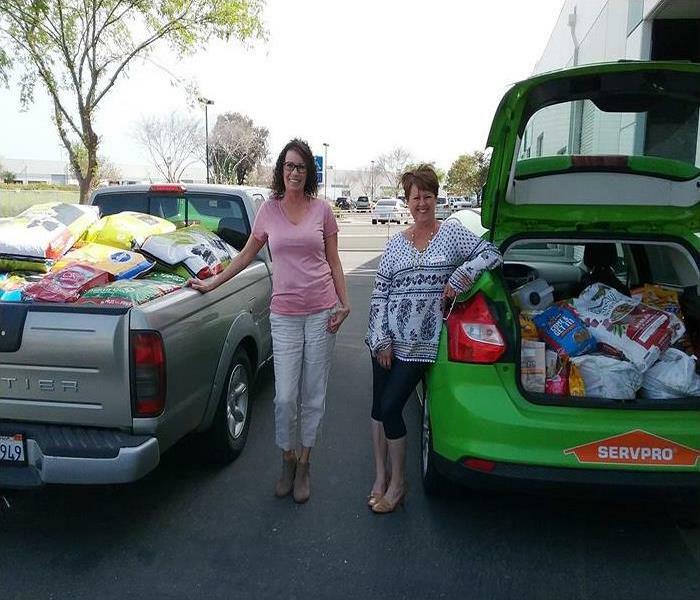 Our team at SERVPRO of Stockton would like to thank everyone who participated in our pet food drive for the Delta Humane Society. We collected 2,050 pounds of pet food! SERVPRO of Stockton is a big supporter of the community, and this charity is very important to our team. 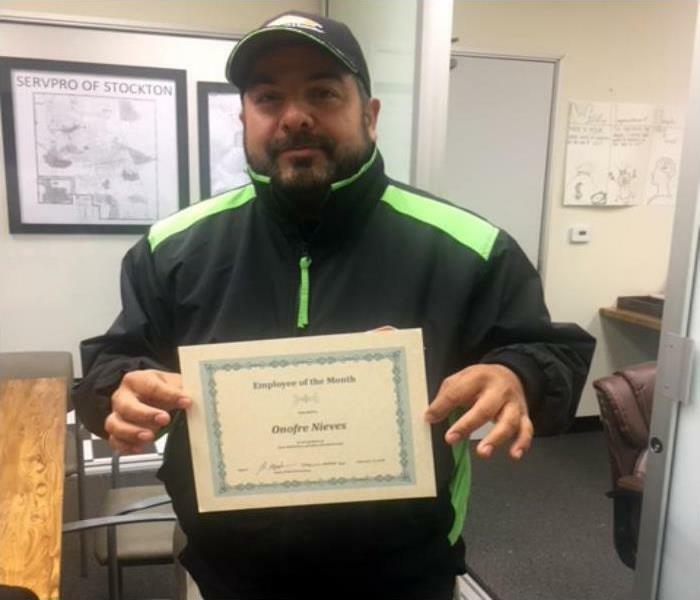 SERVPRO is proud to announce the employee of the month is Onofre "Ono" Nieves. Ono is a highly trained and certified technician with experience in specialty cleaning, water mitigation, and reconstruction. Not only is he an asset to our team he is a customer favorite. 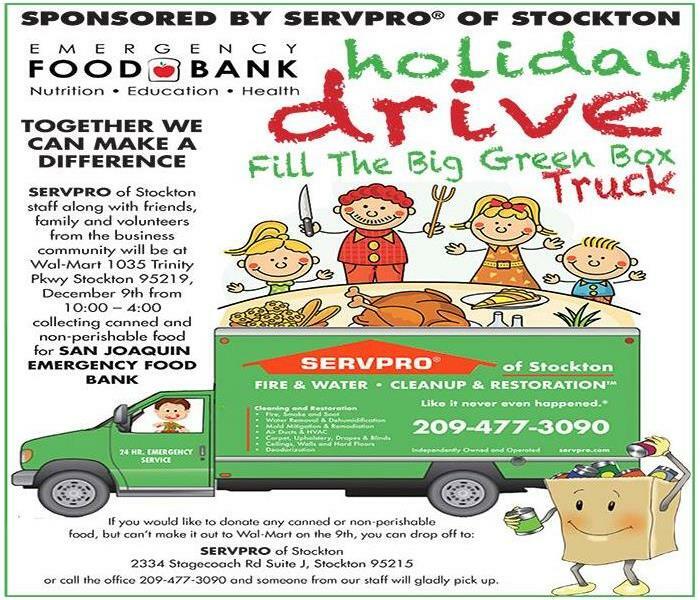 The team at SERVPRO of Stockton is hosting a Holiday Food Drive this year. The event is on December 9th from 10:00 – 4:00 and is held at Wal-Mart located at 1035 Trinity Pkwy Stockton. Our team will be collecting non-perishable and canned food for the San Joaquin Emergency Food Bank. If you can't attend the event, we will be collecting items at our office located at 2334 Stagecoach Rd Suite J or call us at (209) 477-3090 and a member of our team will gladly pick up your donations. Help us fill the Big Green Box Truck! As you can see by the photo of the toys we collected, our recent toy drive was a HUGE success. The toys will be donated to the Gospel Center Rescue Mission Shelter of San Joaquin County. 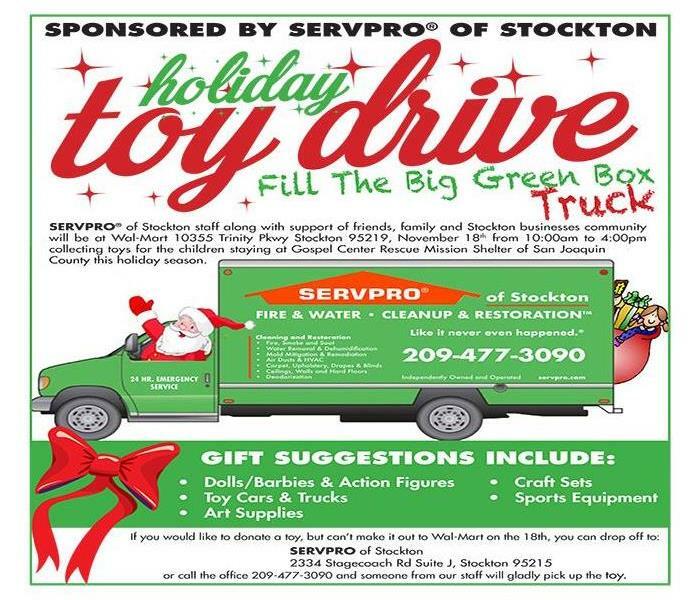 The SERVPRO of Stockton team will be hosting a Holiday Food Drive at Walmart on Saturday, December 9th from 10 AM - 4 PM. We will be collecting cans and non-perishable food items for the San Joaquin Emergency Food Bank. You can help us make a difference this holiday season by donating to the food drive. Our team is always happy to support the local community, especially during the holiday season. 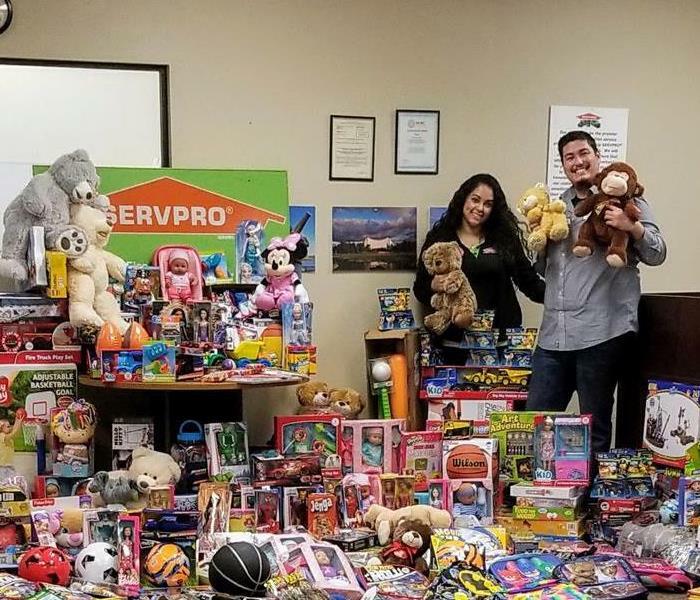 Join the team at SERVPRO of Stockton for the Holiday Toy Drive on November 18th. We will be Wal-Mart located at 10355 Trinity Pkwy Stockton 95219 from 10:00 am to 4:00 pm. We will be collecting toys for children staying at Gospel Center Rescue Mission Shelter of San Joaquin County. Gift suggestions include toy cars & trucks, art supplies, sports equipment, craft sets, dolls/barbies, and action figures. If you cannot make it to the event, you can drop off your donation at our office located at 2334 Stagecoach Rd Suite J, Stockton 95215 or call 209-477-3090. We are big supporters of our community and are glad to bring joy to the children this Holiday season. SERVPRO is ready to help. 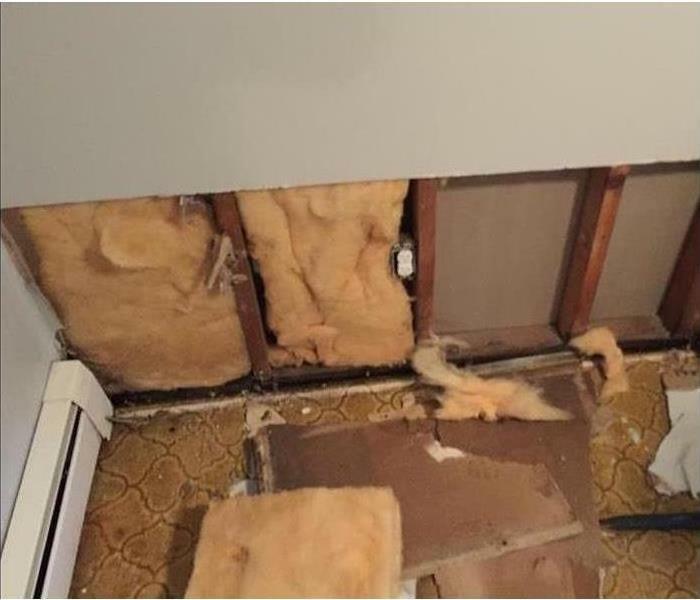 Our SERVPRO of Stockton staff is highly trained in residential and commercial property damage restoration. 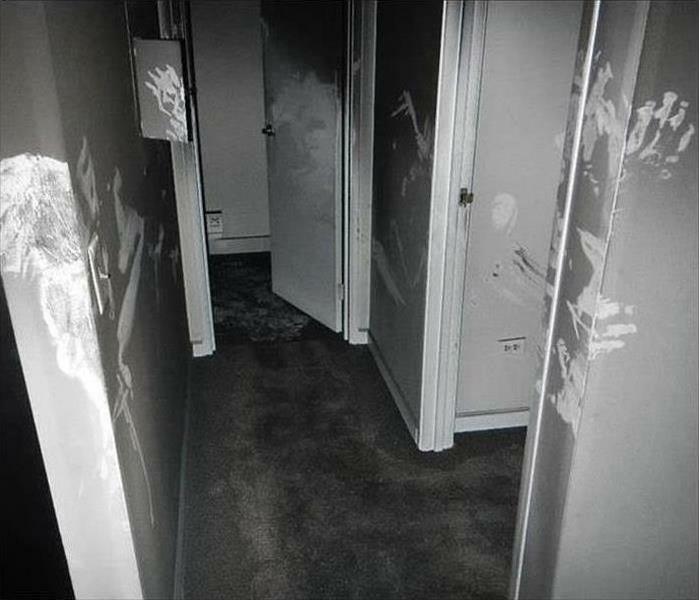 You don’t have to be scared of water, fire, smoke or mold damage this Halloween season. You can be confidant that our local staff has the knowledge and experience to quickly restore your property. 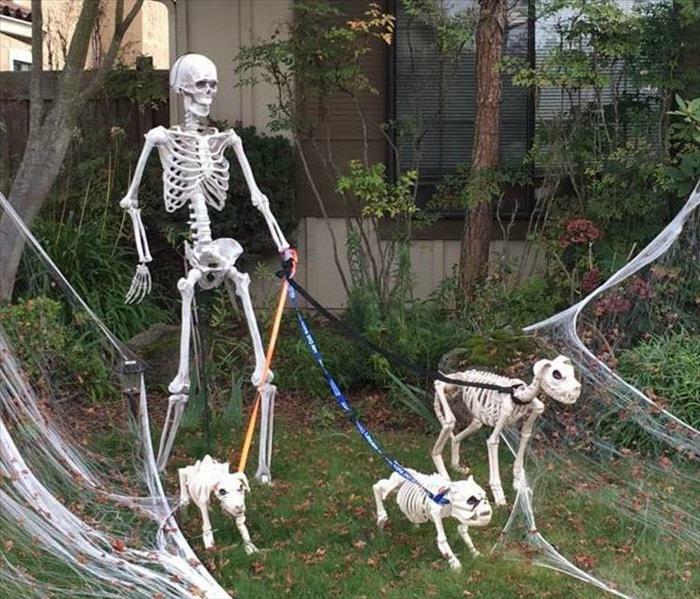 We provide emergency restoration services 24/7/365, including holidays like Halloween. SERVPRO of Stockton is a sister franchise with SERVPRO of San Leandro. The San Leandro Police Department hosted their annual United 4 Safety event! United 4 Safety is an annual summer fair that offers families fun, food and more. This event is a great opportunity for the community to support their police and for departments. 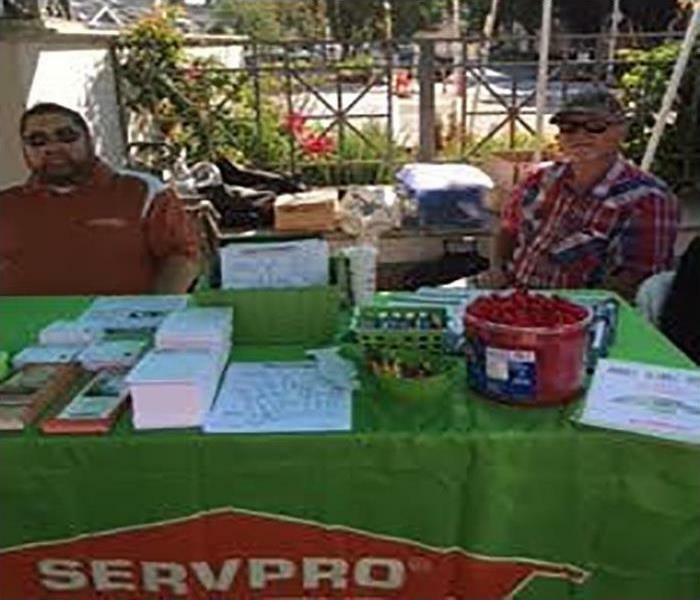 SERVPRO of San Leandro with help from SERVPRO of Stockton has attended each year and we work with the police department with the recovery and cleanup of disasters. SERVPRO is proud to support our community! SERVPRO of Stockton was proud to be invited by the Food Bank to this BBQ to honor the donors, like us who strive to help make our local communities better and safer. Included were donors from Doctors to PG&E. We collect food, as requested by the monthly list, for this excellent organization to help feed the less fortunate. We also are proud to host our own Annual Show the Love Food Drive, which is held in February each year. Please stop by our franchise office and drop off some foodstuffs. SERVPRO of Stockton is here to help our Community. The YMCA of San Joaquin County is committed to enriching the lives of all youth in San Joaquin County, including those who are at-risk. They believe that all youth deserve the opportunity to discover who they are and what they can achieve. That’s why, through the Y, thousands of young people in San Joaquin County are cultivating their values, skills, and relationships that lead to positive behaviors, better health, and educational achievement. We, at SERVPRO of Stockton (pictured is "Team Green"), fully endorse this great endeavor, and are proud to give back to our local community. 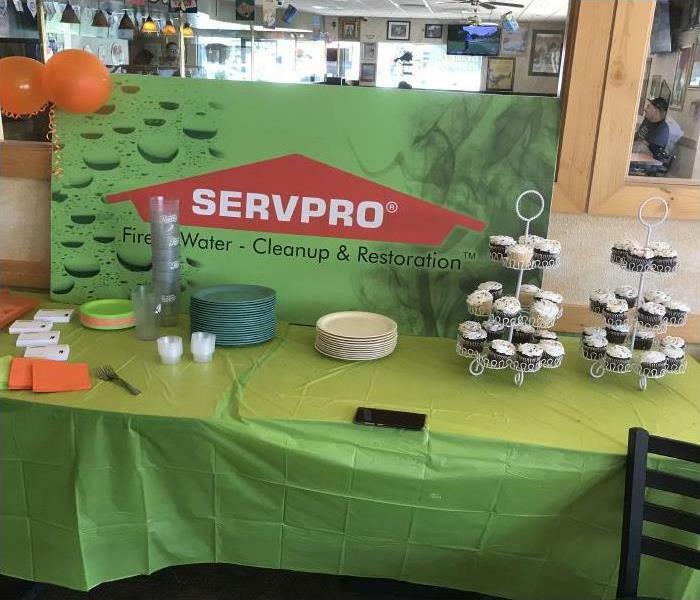 It was an honor when they asked SERVPRO of Stockton to be part of their yearly tradition at this golf tournament at Brookside Golf & Country Club on April 25th. Pictured are Jackie and Santi with our guest Dan MacDonnell, Facilities Manager at Cort Company. The insert is April Lewallen. Not only were we vendors but we also participated in the event, which I am happy to say was a smashing success. We agree that we remove water and perform clean up services better than we play a round of golf, but it was all for a great cause. "Fore!" But No "Hole in One." 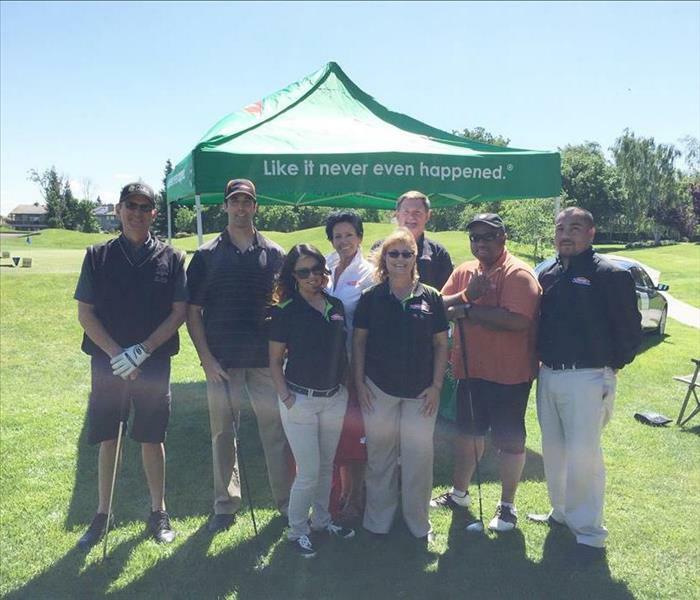 As vendors we sponsored the "Hole in One" at the 17th hole and had our tent displayed with Pride.. Go Team Green! It was quite a beautiful hole overlooking the pond. Yes, quite a few balls landed there with a splash. 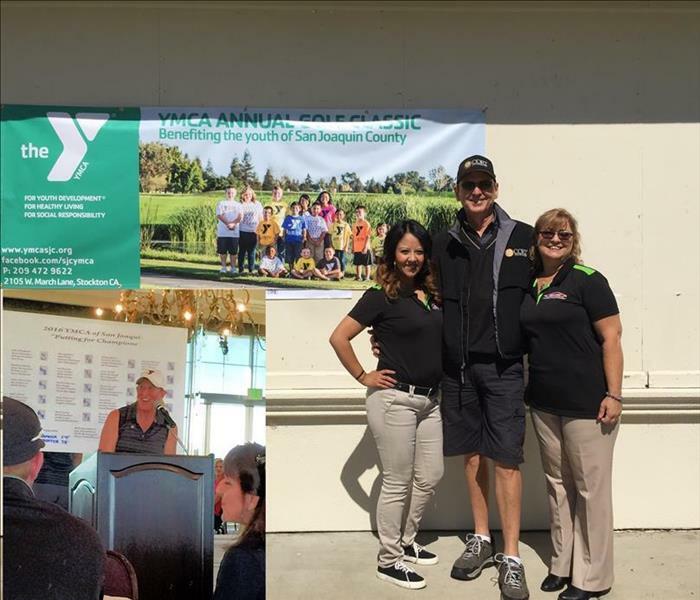 It was a breathtaking view, and we also had some moments of excitement when a few golfers came quite close, including the CEO of the YMCA, April Lewallen, to holing out. Sad to say no one scored a Hole in One. Jackie and Santi were disappointed they didn't get to give away the $10,000 prize money. The YMCA of San Joaquin County put on quite a fund raising event. Indeed, a worthy cause, giving opportunities to all the young boys and girls of our Stockton area. Our keynote speaker was Maurice Greene, if you blinked, you might have missed him. We consider him part of our "Green Team." 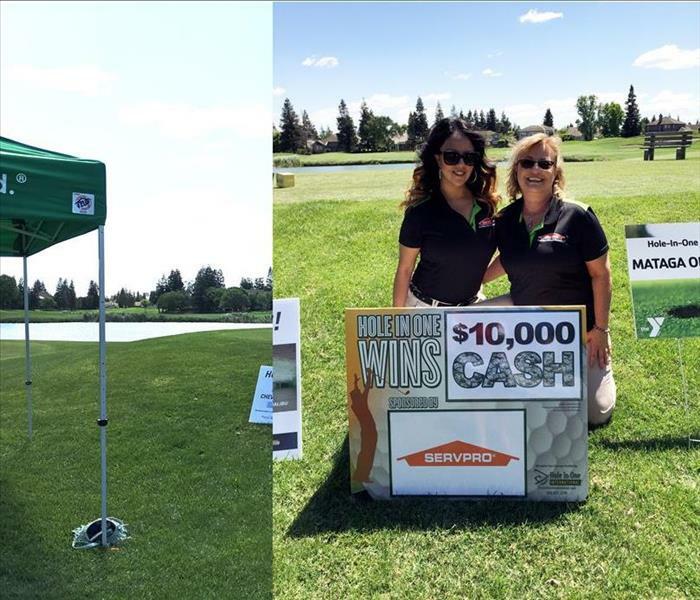 SERVPRO of Stockton was proud to help sponsor this community event and hopes that some of the blazing speed of this Gold Medal Olympian will rub off on us as we try to preserve the properties of our local residents. Even though there were no "Holes in One," during the golf outing, are youth were the big winners. 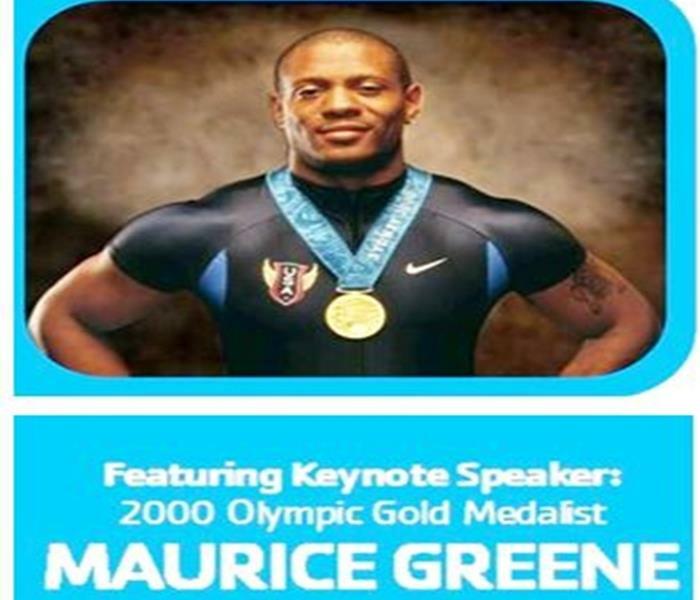 Famed Olympian Sprint Champion and 2000 Gold Medalist, Maurice Greene, was the keynote speaker at the dinner. 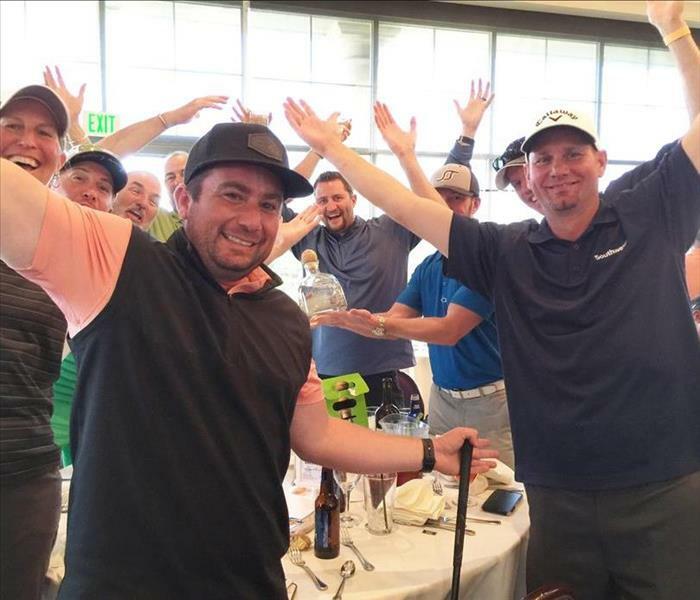 We presented to Brady Rankin with The Mohan Group, SERVPRO's Business card drawing winner, a Fine Bottle of Silver Patron, which, as you can see, he and his guests enjoyed. We had fun but never lost sight of the ultimate goal, assisting our local youth in finding their way to a happy and safe future. We look forward to next year's YMCA Tournament. GO TEAM GREEN ! And Go San Joaquin County Youth! 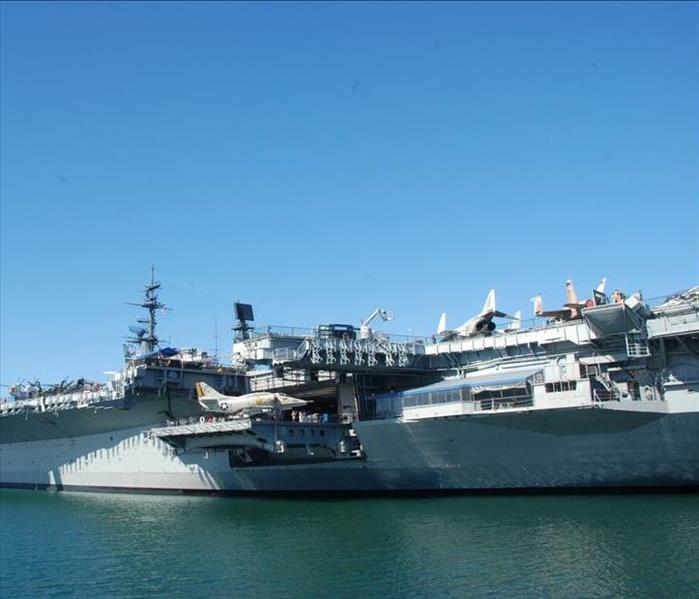 The WW2 aircraft carrier, The USS Hornet has become a national landmark and is now a museum ship. It’s a popular attraction for school students, history buffs and tourists alike. The aircraft carrier is located in at the former Naval Air Station, Alameda in the San Francisco Bay Area. SERVPRO of Stockton is associated with SERVPRO of San Leandro and is part of the Cleanair Image ownership group. We took part as a volunteer to help clean the great ship that is also famous for retrieving NASA astronauts from their 1969 splashdown in the Pacific after their journey to the moon. Ownership, managers and technicians performed pressure washing of the hangar bay deck and dusting of the portions of the ship interior that are on display to tours. It was an honor to support our community and a privilege to honor all the great men and women who have served aboard the USS Hornet, a national treasure. Jackie Irrgang of SERVPRO of Stockton speaking with a SUSD custodian. The Stockton Unified School District holds two or more custodian training and motivational workshops each year. 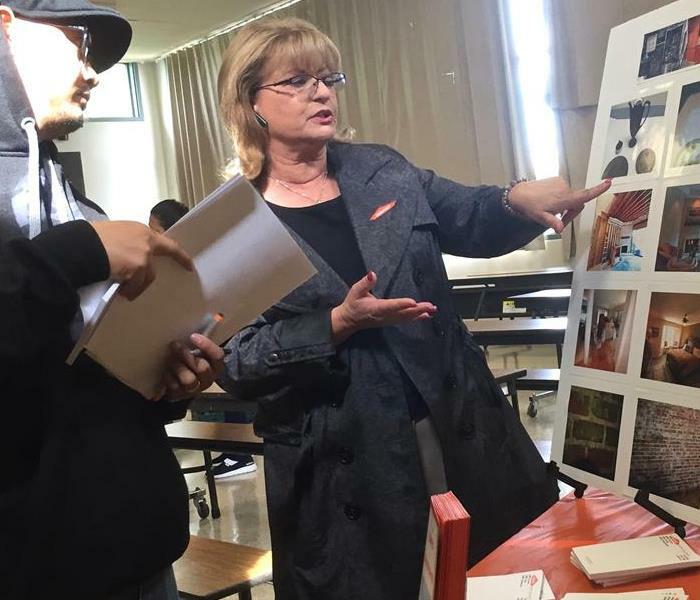 Since 2015, Jackie Irrgang a Sales and Marketing Representative of SERVPRO of Stockton, has arranged for our cleaning and restoration company (an approved vendor) to attend and participate in these meetings. We give a formal presentation from the podium and we interact with the school district custodians and maintenance team at our our display table during breaks, at lunch and at the conclusion of the event. Jackie enjoys meeting with and talking to the hard working school employees. This is just another way that SERVPRO of Stockton is involved with and supports our local community. The employees of SERVPRO of Stockton are pleased to organize and participate in at least two food drives each year for the Emergency Food Bank of Stockton/San Joaquin. It feels good to give back to our community. We want to thank our partners in this effort who contributed gifts of boxed foods: Brown and Brown Insurance, Delta Village Apartments, Eagle Construction, George Azevedo Sate Farm, Grupe Real Estate, Sherwood Executive Center / Stonebros Management and Truex Insurance. Jackie Irrgang of SERVPRO pictured with donated foods. SERVPRO of Stockton "Show Your Love Food Drive" is an annual event that coincides with Valentine's Day. The purpose is to collect food and specifically as much boxed food as possible for the Emergency Food Bank, Stockton and San Joaquin. 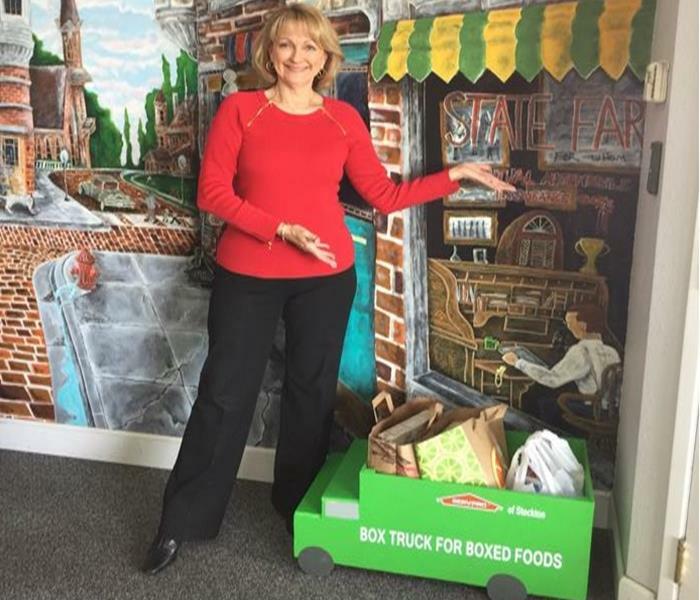 SERVPRO of Stockton, Business Development Representative, Jackie Irrgang places wooden replica SERVPRO box trucks in customer's offices so their employees can make food donations to be picked up by Jackie. This year's collection was especially impressive. Jackie wants to acknowledge the following Stockton companies for their generosity: Brown & Brown Insurance; Sherwood Executive Center by Stone Bros; George Azevedo State Farm Insurance; Truex Insurance, Delta Village Apartments, Eagle Construction and Grupe Real Estate. We specialize in the cleanup and restoration of commercial and residential property after a fire, smoke or water damage. We’re proud members of the local community and we want to thank all of the local businesses that donated. SERVPRO of Stockton is proud of our experienced team of certified and trained employees who care about the local community. Thanks to all the local businesses who donated food to a great cause. The Annual Greater Stockton Food Bank Drive once again got off to a great start. Jackie Irrgang, SERVPRO of Stockton's Business Development Manager, placed one of our fleet of little green, replica Box Trucks at the State Farm office. Janet Azevedo was kind enough to make sure the Green Box Truck was fully equipped with food before it was "driven" back to the Food Bank. Many thanks for the help our partners offer as we help make our local communities better and better. 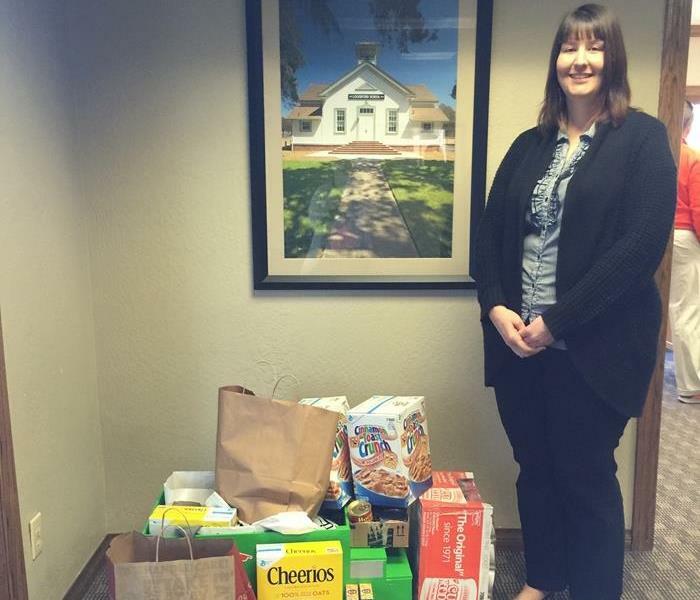 The contributions made by team at Truex Insurance to the Annual Greater Stockton Food Drive were impressive. SERVPRO of Stockton would like to thank Samantha for spearheading the effort to "fill her up" with food donations. Our Green Box Truck will make several trips to help supply the Greater Stockton Food Bank. We are proud to do our part for our local communities. We will always respond to our friends and neighbors with donations and restoration assistance. Clayton A. Barry, Partner of SERVPRO of Stockton made an educational presentation concerning mal-odor elimination for the Stockton Unified School District (SUSD). More than 100 custodians and maintenance staff from the school district were in attendance. Clayton and SERVPRO of Stockton is proud to provide support to the hard working men and women of the SUSD who keep our school facilities safe and clean. SERVPRO of Stockton ownership, managers, and employees support the city of Stockton and many local organizations. We are pleased to be active Chamber of Commerce members and good friends of the American Red Cross. We participate in Chamber of Commerce golf tournaments, educational programs and social mixers. 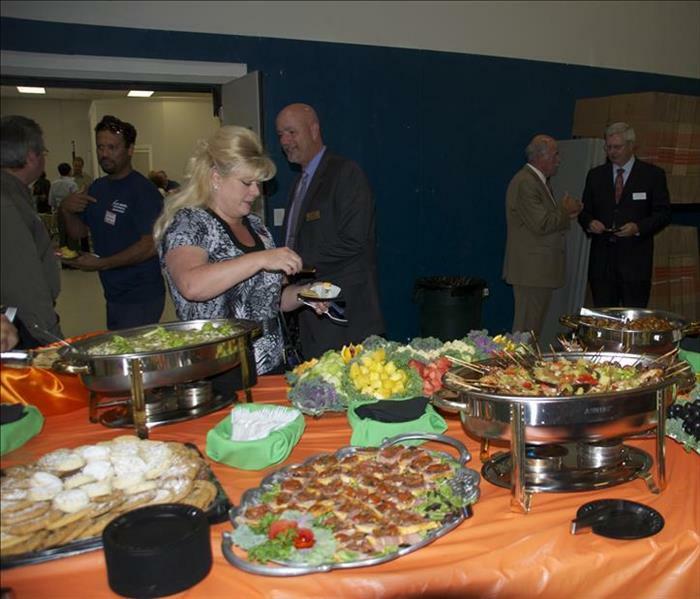 The photo above shows SERVPRO hosting a mix and mingle fund raiser for the American Red Cross at our local cleaning facility. We are active members of the Red Cross Ready Rating Program and we are very serious about helping other companies prepare for recovery after natural disasters. We must be prepared to aid victims of flooding, earthquakes, or fires that could strike the Stockton community. We are water and storm damage specialists who get started quickly to get your property dry and back to pre-storm condition. Call us at (209) 477-3090 for more information. 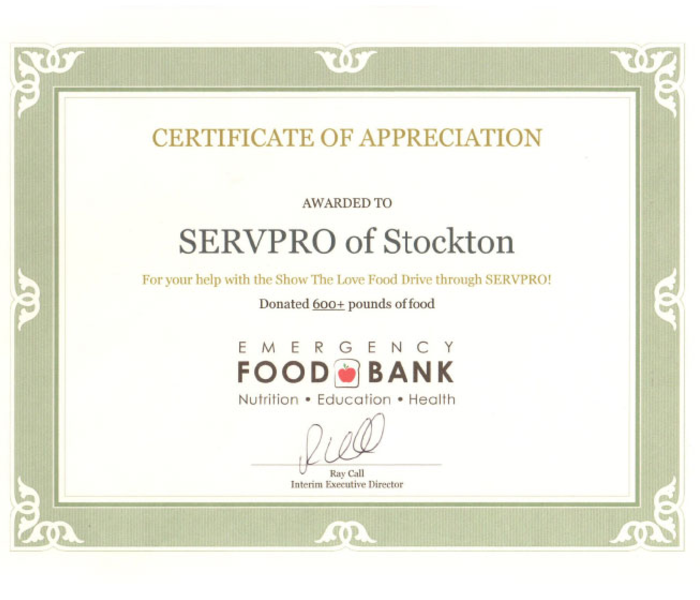 SERVPRO of Stockton is most proud of the work we do throughout the year on behalf of the Greater Stockton Food Bank. We have built a fleet of small green SERVPRO trucks that collect food donations. The trucks are delivered to businesses and churches throughout the Stockton community. Once they are filled with food donations we collect the truck and take the food donations to the food bank. Our fleet of small green SERVPRO trucks (see photo above) works double duty by being Santa's Bag during the holiday season for the Marine Corps "Toys for Tots" Program. We even helped construct a house for ‘Habitat for Humanity’ and are proud to serve the local Stockton area communities. Here at SERVPRO of Stockton, we are very proud to participate in many functions at our hometown baseball stadium, some through the Chamber of Commerce. 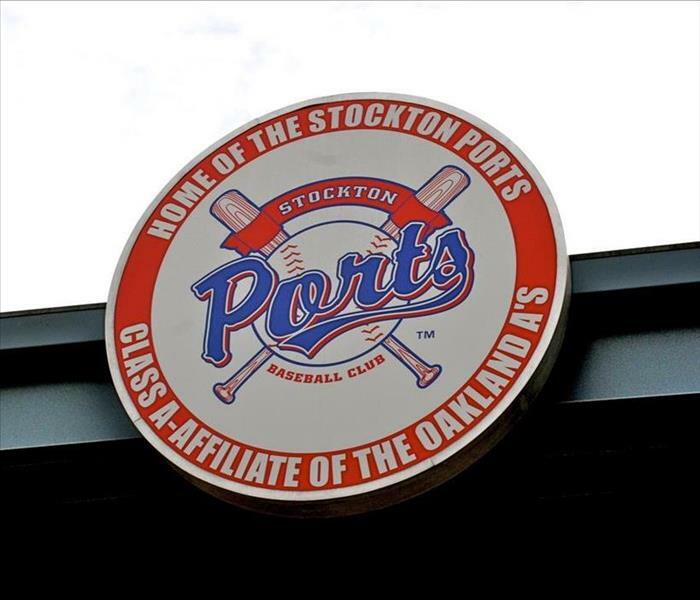 We support our local Stockton Ports and have even been willing to strike out for the cause. Just as the team provides entertainment, a hot dog, and a sports outlet for Stockton area residents, we can provide our fellow neighbors with tips on safety and recovery in times of flooding, water damage or fires in the Stockton community. Don't get "thrown out at home!" We all play for the same team. Call us at (209) 477-3090 for more information on protecting your family. SERVPRO of Stockton explains how our odor reducing equipment works.